The accompanying picture is my brand new powerchair. It's a Permobil F3. 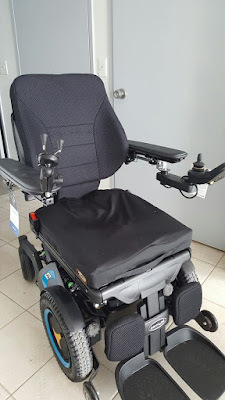 Those who read this blog regularly will know that I tried this chair out at the 2015 People In Motion (PIM) show knowing that I would be getting a new chair in 2016. For me, the main selling point of this chair is it comes with snow tires. That's because it has a mid wheel drive. Most powerchairs get stuck in the snow. It has some other features including one extra that I have been asked by my supplier not to discuss because if I do, everyone else will want one. If you really want to know, you can direct message me on Twitter. I won't break my promise publicly. This is my third powerchair from my third different supplier. When I approached my previous supplier about the Permobil F3, he wasn't too interested probably because Permobils tend to be more expensive than what they would normally supply. My previous chair was OK but it needed service too frequently. The biggest problem seemed to be with casters and the forks that hold them. In fact, the left front caster went bad on Friday and probably needs to be replaced. And I should mention that chair is still here for now but it will be junked. When I went to the 2016 PIM show, I talked to Permobil and they suggested I talk to Randy Keith at Motion Specialties. And if you read my review of the show, you'll know that Randy was at the show. He works in Motion's Toronto office but he's originally from British Columbia. He's been in the mobility business for 40 years. He knows how to handle Ontario government paperwork. He left me a demo to try out and I took it out on a road trip. The chair was ordered in August and it was finally approved in March. As I joked on Twitter, it's like giving birth. When the caster went bad on Friday, I was going to call Randy today to see where my chair was at. But he called me an hour later to tell me he was bringing it today. The chair is manufactured to my specifications. The major difference is the seating is much lower because of my height. Not only can I get snow tires but the tires are filled with gel. So no more flat tires and the gel provides a smooth ride that air filled tires provide. My previous supplier tried convince me to use hard rubber tires but they don't provide a smooth ride which can lead to back problems. The only thing is this chair doesn't manoeuvre as well indoors. That will take some time for me to get used to but the chair has different speeds for indoor and outdoor mode. So I'm running it slowly indoors for now and increasing the speed when I go out. I haven't gone out to Rabbas yet and there are already two adjustments that it will need. I may find more when I take it out. One of the reasons Randy likes Permobil is they don't need service as frequently as other brands. We'll see if that's true. Good luck with your new chair Frank, I hope it works out. Yours Defshepard.